The Teddy Bear Hospital has been contributing to the success of The Good Friday Appeal Kids Day Out since 2012. An annual fundraising event for the Royal Children’s Hospital, this year the Appeal had over 80,000 local and rural attendees at the Melbourne Convention and Exhibition Centre (MCEC) and raised a record of $17.4 million. 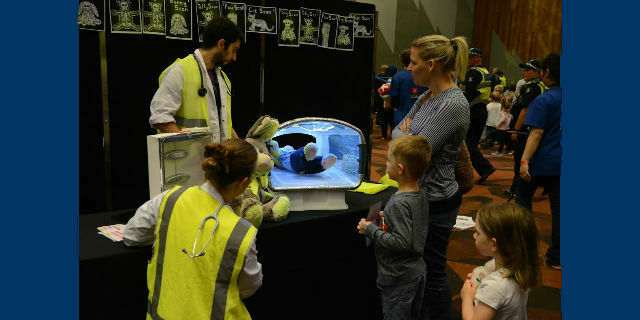 The Teddy Bear Hospital (TBH) is the major draw-card at this event and, as the University of Melbourne’s largest student engagement activity for the year, the value to the positive profile of the University and value to the students learning is inestimable. This year the TBH section proudly raised a record of over $23,500 for sick children at The Royal Children’s Hospital. TBH expanded in 2016 to include over 900 student volunteers from both medical and allied health disciplines. This number of volunteers is a milestone for TBH, the Faculty of Medicine, Dentistry & Health Sciences, and, another record for student volunteer engagement at the University. The students saw 3600 children and their teddies on the Appeal day. TBH attracted major publicity and media coverage displaying our students with children positively contributing to the community in a myriad of engaging and innovative health related activities including: Teddy triage (where Teddy’s are assessed to determine which Teddy’s need to be flown to the hospital or taken by ambulance), anatomy, height and weight, doctors, nursing, immunisation, sun smart lessons, intensive care unit, dentistry, optometry, physiotherapy, audiology, healthy eating, surgery, Teddy therapy, ambulance, borrow a bear service, and Royal Flying Teddy Doctor, all complimented by Teddy x-ray machines, dentistry chairs, surgical bears and ambulances . TBH’s next major upcoming event is the Winter Check-Up at Chadstone the Fashion Capital on July 23-24, where there will be more great activities for students to get involved in multidisciplinary teddy bear care to assist in reducing children’s anxiety around health care in a fun and interactive way.